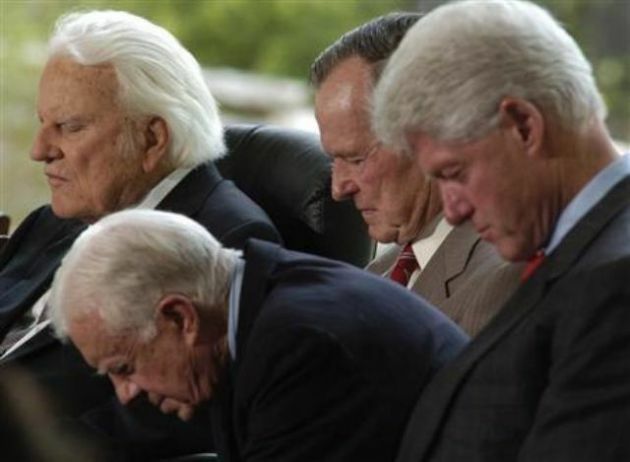 (Reuters/Robert Padgett)Evangelist Billy Graham with former U.S. presidents Jimmy Carter, George H.W. Bush, and Bill Clinton in 2007. One year after the Russian Revolution 100 years ago on Nov. 7, Billy Graham was born. "Nov. 7 will be a big milestone for my father as he turns 99 and enters his 100th year," said Franklin Graham, the son of the elder Graham and the president and CEO of the Billy Graham Evangelistic Association, who is continuing the legacy. "As a family, we are just so very grateful that he is still with us. His mind is good but he's quieter these days. He can't see or hear well, but his health is stable." Born in 1918, evangelist Graham has preached the Gospel to nearly 215 million people in more than 185 countries and territories. A 1949 Los Angeles Crusade vaulted Billy Graham into the public eye. He was ordained as a Southern Baptist minister and his preaching gained its traction mainly among middle-class, moderately conservative Protestants. He held large indoor and outdoor rallies; sermons were broadcast on radio and television, some still being re-broadcast into the 21st century. In his six decades of television, Graham is principally known for hosting the annual Billy Graham Crusades, which he began in 1947, until he concluded in 2005, at the time of his retirement. As of 2008, Graham's estimated lifetime audience, including radio and television broadcasts, topped 2.2 billion, ABC reported. Because of his crusades, Graham has preached the Gospel to more people in person than anyone in the history of Christianity said the 13WLOS station in North Carolina. Billy Graham shot to fame in the late 1940s and 1950s, holding huge crowds spellbound with his passionate preaching at crusades throughout the world, USA Today said Nov. 7. While he had movie star good looks and charisma to spare, Graham kept the focus on bringing people to Jesus Christ. In addition to the catalog of Graham's motivational messages and sermons, "The Billy Graham Channel" a new forum will also include personal reflections on the pastor's life by family and friends including Billy Graham's son, Franklin Graham, and his daughter, Anne Graham Lotz who continued his evangelizing work. Christian Headlines said Dr. Graham has preached the message of Christ's freedom and forgiveness around the world, reaching over 200 million people in more than 185 countries. "He's had the privilege of leading hundreds of thousands of people to pray to receive Jesus Christ into their lives as Lord and Savior. Graham has authored 33 books. He is known as the "pastor to Presidents," and he has offered spiritual support and guidance for United States presidents from Dwight D. Eisenhower to George W. and George H. Bush. He has been a friend to celebrities, politicians, athletes, and leaders, such as Martin Luther King, Jr., Bono, Muhammad Ali, Johnny Cash, Larry King, and WWII hero and Olympian Louis Zamperini. In his last message in the 2013 video-recorded My Hope America, Graham senior said, "Our country's in great need of a spiritual awakening. There have been times that I've wept as I've gone from city to city and I've seen how far people have wandered from God." Billy Graham has been named by Americans as "One of the Ten Most Admired Men in the World," a record-breaking 60 times with the Gallup poll. He has been known through the years as not only a world-renowned evangelist, but as a kind, non-judgmental, accepting, and humorous soul.